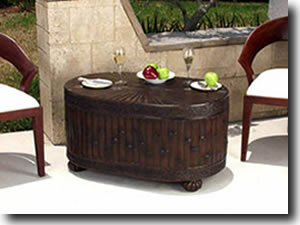 ATELIER INTERNATIONAL is a designer and manufacturer of beautiful and unique home furnishings. Industry veterans with imagination, manufacturing capability, and design excellence - we bring a unique vision to our furniture and accessory products. The products in this catalog are ours alone, we are the designers. 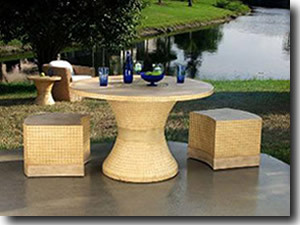 They are designed and manufactured to be used outdoors, or indoors - from there it's up to your own imagination. From seaside to yacht, from lakeshore to mountain escape, to your backyard and beyond, our goal is to bring you closer to your dreams for your own haven from the cares of the world. 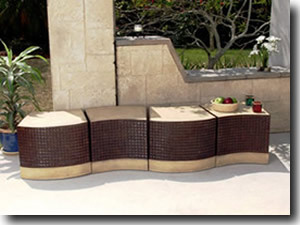 We believe that, just because furniture may be used outdoors, it doesn't have to be boring. We believe that "designer style" and "outdoors" can be used to describe the same furniture...if a company uses imagination. We believe "What if ?" is a challenge, not a dream. We believe that, if the outdoor areas of your home are pleasing to your eyes, you will spend more time out there... We believe this is a good thing. And we invite you to return occasionally to see what's new.